Well, what can I tell you about the Litchfield park tour that the kids haven’t already done? The crocodile feeding part of the tour was touristy for sure – I did read ahead of time that the jumping action that is exhibited is a natural one for the crocs. They also feed them very little for a crocodile and make them work for it, so it’s not their only source of food, and of the over 6000 crocs in the river there’s only about 150 that feed from them and even those feed sporadically with the tour, so there’s plenty of wildness around. I loved the experience, and especially seeing the raptors feed up close, though I have to admit I feel a little weird about the whole thing hence the need for me to justify myself. It’s just not totally natural. But, oh man, I will never forget the sound a crocodile’s jaws make when they snap shut. 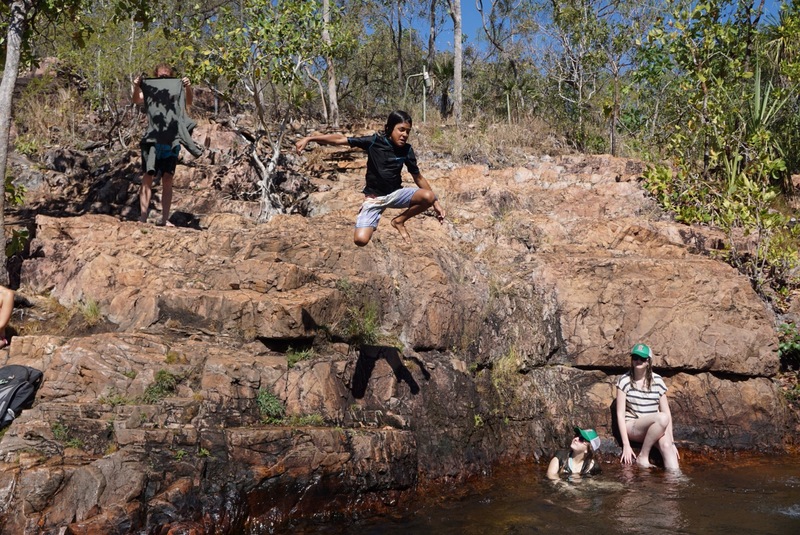 The other part of the trip was visiting the swimming holes, which were absolutely stunning. 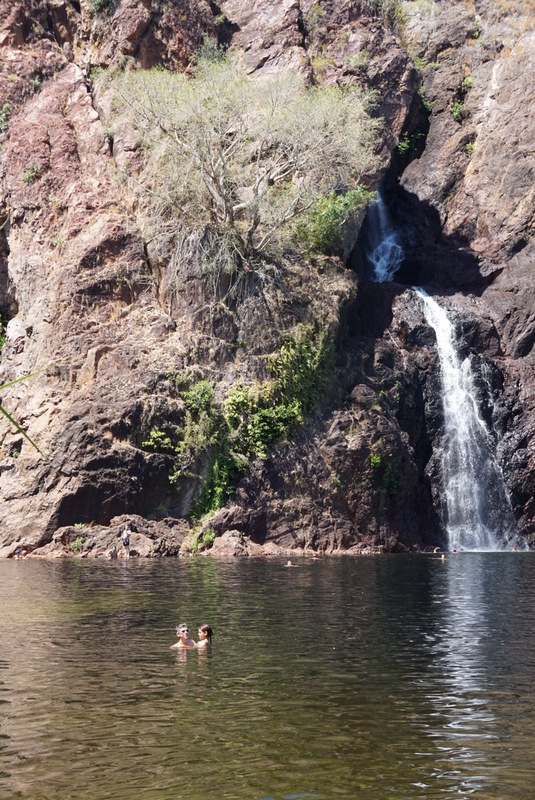 I’ve never gone somewhere where you jump into a natural pool surrounded by waterfalls that feed into it. 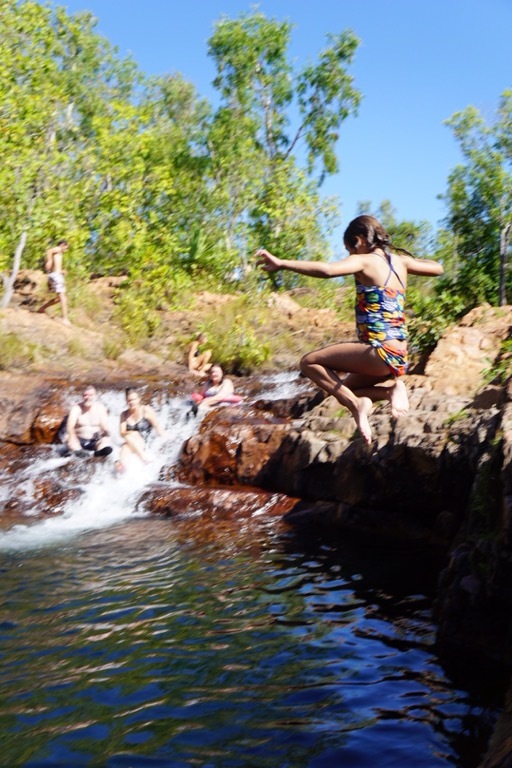 Fun fact: it’s the dry season and hasn’t rained in months, but the waterfalls are fed because the stone surrounding them is a porous sandstone that soaks up water during the wet season and then releases it during the dry! The second stop was especially nice, where there was a 10+ meter deep pool that the kids could jump into, and they did, over and over. 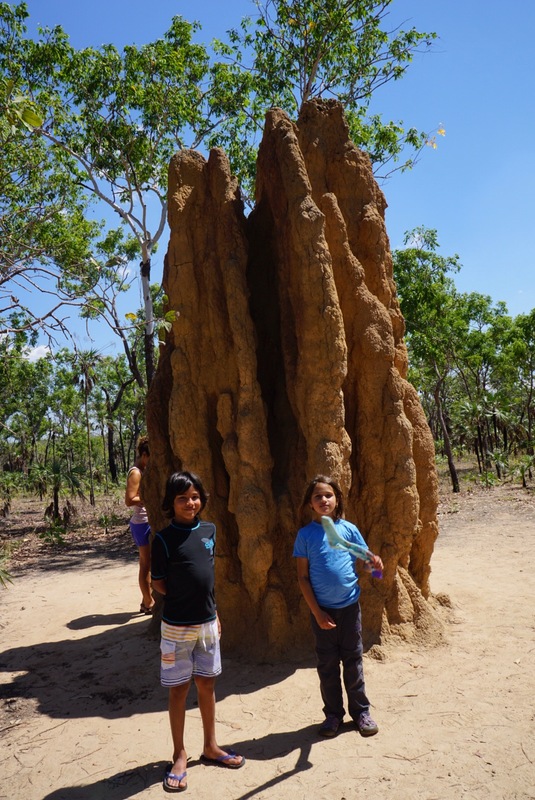 And seeing the massive termite mounds was a thing to behold! There were some fresh areas that the guide crumbled away to reveal scurrying termites, who would have the hole repaired in fifteen minutes. The next morning we went to the excellent Northern Territory Art Museum, which has wonderful examples of indigenous art both historic and contemporary. You can really see the differences in the art from different areas. Northern Territory art was done on eucalyptus bark, and used natural pigments and many fine lines as well as larger figures drawn with the same fine outlines, whereas more centrally was the dot paintings which I talked about earlier. 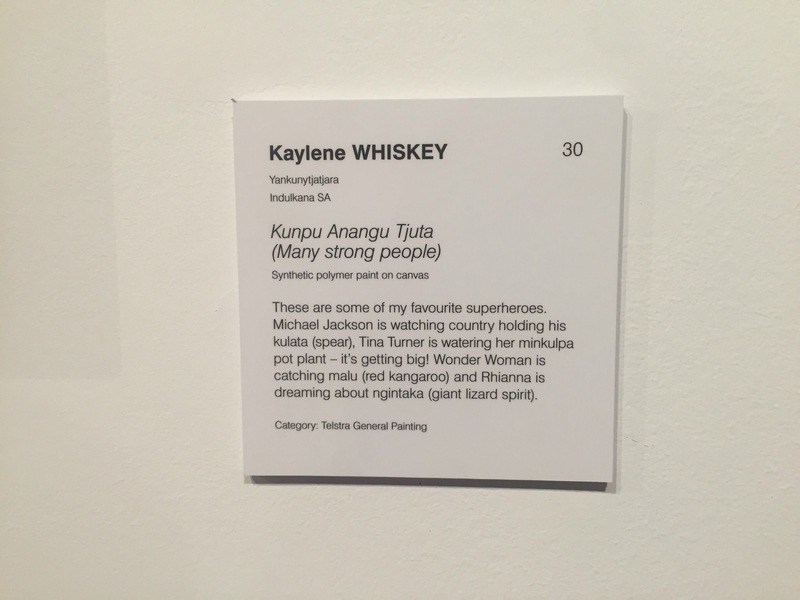 Upstairs they had an exhibition of Aboriginal art award winners from a yearly contest – here is one with the artist’s explanation. 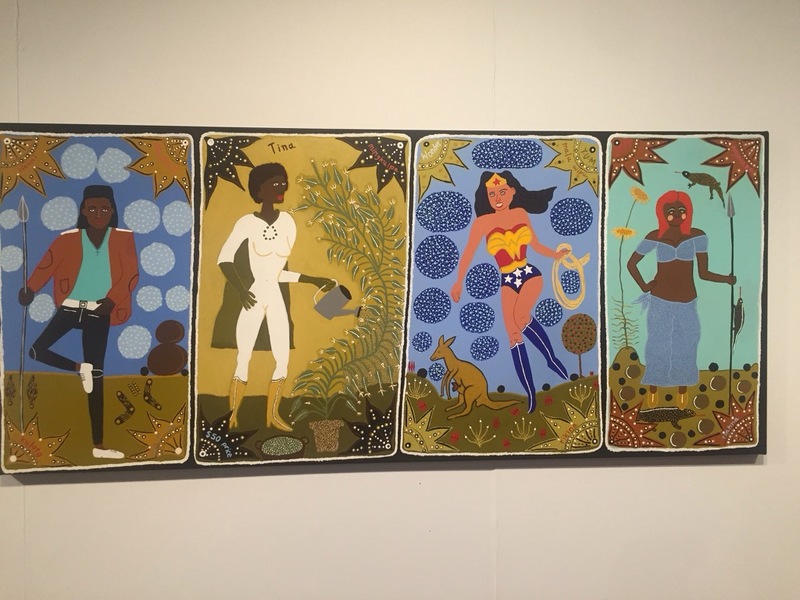 I love the mixing of modern heroes and ideas into with the traditional dots and plants/myths. What we did in Australia was the equivalent, geographically, of flying from San Diego to Seattle, then to Utah, then to Chicago. Think about how different all those places are from one another, and it’s not hard to see the ground we covered here. It’s a big continent! I loved Sydney, Port Douglas and Uluru. Alice Springs was a good place to visit but I wouldn’t want to stay there long. Darwin, our last stop, I found somewhat charmless. Perhaps its the large number of tourists, but people there weren’t particularly friendly overall and the town is poorly laid out. That was the one place I wish I’d done a bit more research on before just staying there for 4 days – I would have instead done a longer jungle tour for a few days or maybe a 2 day tour into aboriginal country instead. One little thing I want to remember to mention is that in Oz and NZ, every single plug had it’s own little on /off switch attached to it. You couldn’t just plug something in, you had to turn on the actual outlet. I wondered if this saves any electricity or not, because if not it was an annoyance. Something my dad pointed out to me which I hadn’t realized is that with my trip to Australia, I’ve visited all the continents except Antartica! I guess I know where I’ll be going the next time I take off for an extended trip! I’ll leave this post with some of the road signs I’ve seen along the way so far, and will then catch up with our trip in Bali. 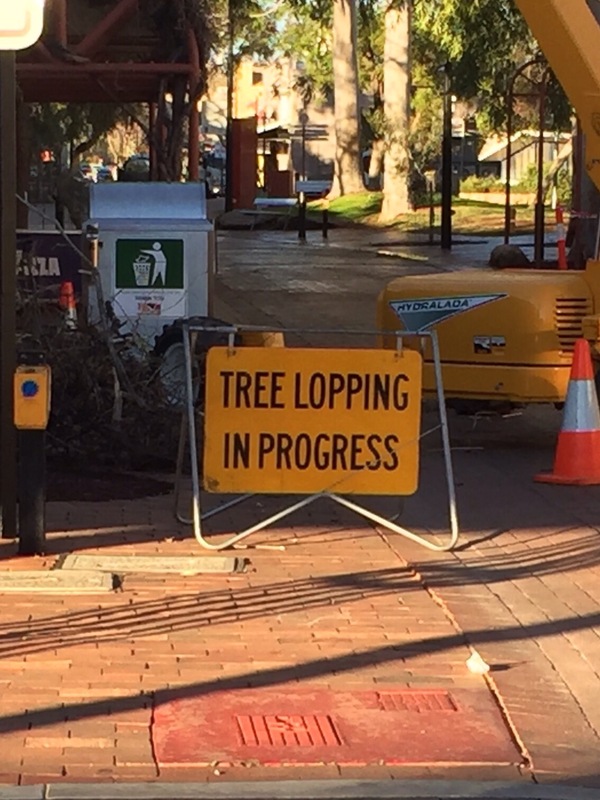 Doesn’t lopping just sound refined? Also, I think the crane and chainsaw would have been a giveaway even without the sign. 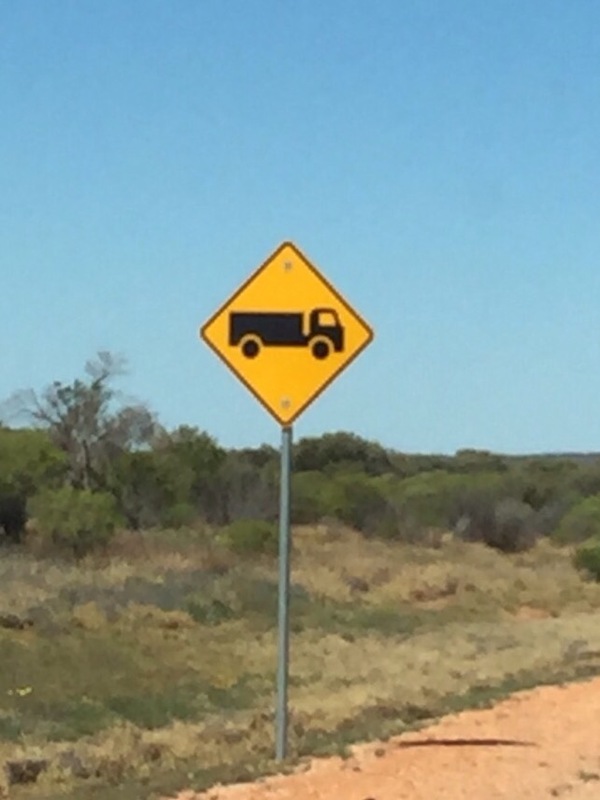 So, there’s trucks on the road? Imagine that. 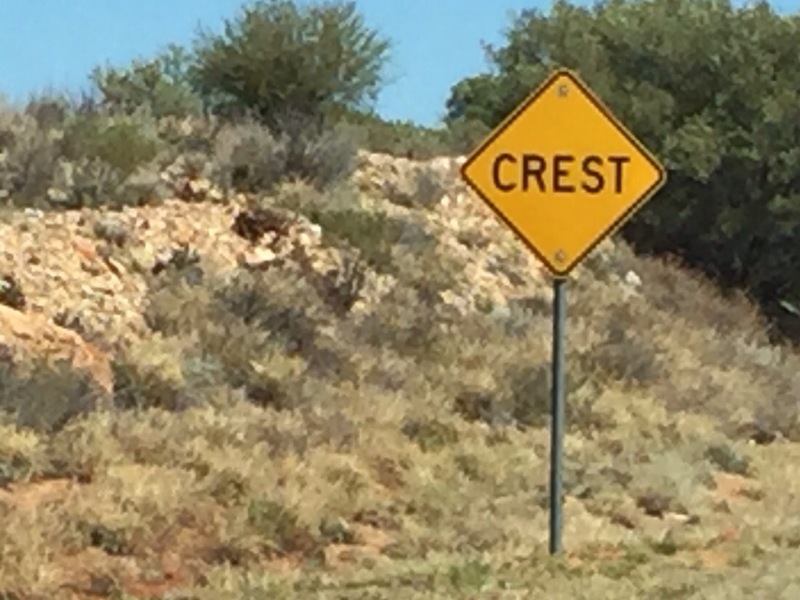 MIght have been nice to see this sign BEFORE i had to pass ten of them. Then I could have been mentally prepared. The road! That hill! There’s an end to it! and usually it was about 100 meteres up ahead. I really thing this is a stealth campaign by proctor and gamble to break the monopoly that Colgate has on the Australian market. 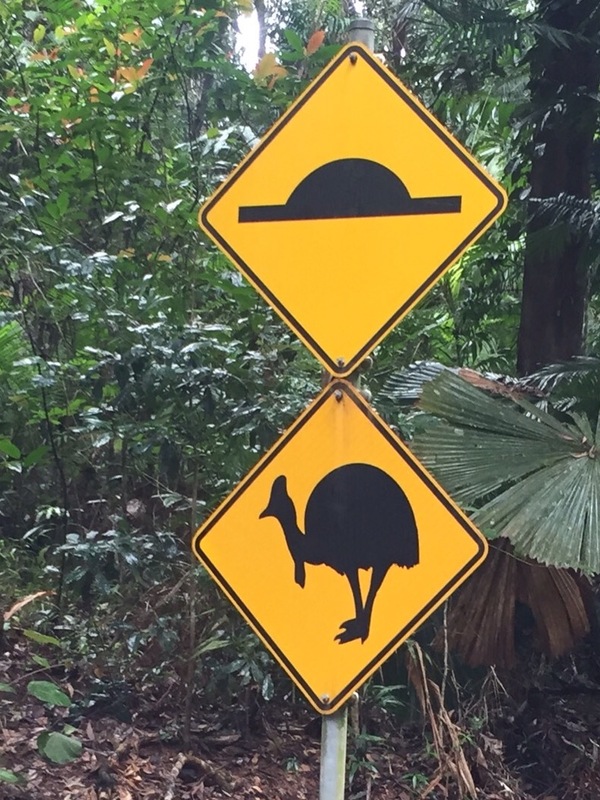 Speed bumps and cassowaries. You know, the usual. Driving skill: making sure the cassowary doesn’t become the speed bump. 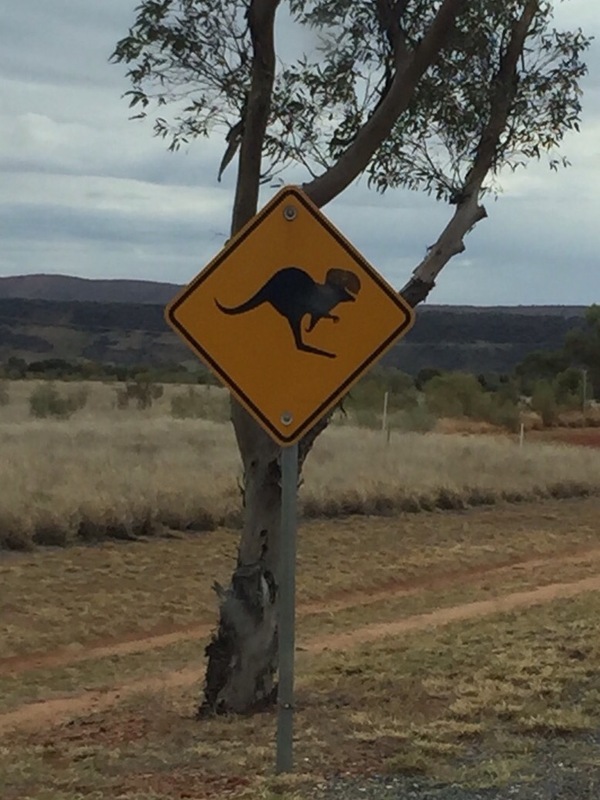 We saw neither scale of T-rex nor hair of wild kangaroo, despite the signs. It was a disappointment not to see either. When we were in South Africa, we were entertained by road signs warning us about Baboons. They were upside-down yield signs with exclamation points – ! Baboons. I’m grateful for those, because dang it I would never want to actually run into a ! Baboon. I’m not an electrical engineer, but here is what I understand regarding why there are switches are on power outlets in Britain and several commonwealth countries. The shortest explanation is that with the switch on each outlet you can stop electricity from flowing into a malfunctioning appliance. The longer version is that the British made a number of poor decisions when first implementing electricity which caused a number of very high profile accidents. To compensate for those poor decisions they took the very British approach of doing the extreme opposite and passed insanely overly conservative laws laws related to electrical safety right after WWII destroyed most of their electrical infrastructure. 1) Bathrooms are not allowed to have electrical outlets in them. In the USA outlets in bathrooms must be GFCI compliant (have little circuit breakers in them) so any water caused short immediately flips the breaker but in the UK they decided to be super careful and simply not allow any outlets period. Because of this you’ll often notice in British homes that the lighting fixtures in bathrooms will have outlets built into them as a work around. 2) Bathrooms also can’t have light switches – only pull strings or switches that are physically outside the door. 2) All plugs (the part you put into the receptacle) must have fuses in them (yes, even in 2016 every computer, flatscreen tv, and reading lamp in Britain has a fuse). 5) The ground pin must be longer than the power pins – it trips a physical switch when inserted into the outlet that opens shutters that cover openings where the power pins go. This makes it impossible to not use a grounded plug. Believe it or not – that’s only a few of their rules. As with any safety standard, those people who have them think anyone without it is an idiot and vice versa but in this case they really did go a bit crazy. Jason that is fascinating!! Thank you for this!